Desperately Seeking Adventure: 2016: No Summertime Sadness! 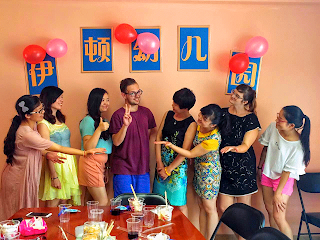 My second summer living in Wuhan, China was equally as epic as 2015, well if not a little more hectic work-wise! Keeping within the boundaries of Hubei's Wuhan City I didn't feel blue for one second, of course there was no summertime sadness going on! From teaching awards to revisiting Jiangsu province I won the title! Summer 2016 had me crazy but I turned it out! Pushing spring out of the way I was bang on a summertime hype during the month of June, getting my life I took the Wuhan Metro to Jianghan Road to finally pay some attention to Hankou's Bund and Riverside District. The former Hankou Customs House no longer serves Wuhan as a trading powerhouse but as a knock-out museum that schooled me about the industrious history that Hankou served. I soaked in the wealth of knowledge regarding Hankou's five foreign concessions, of course the British Concession worn the crown, bestowing a belated British influence on this Hubei city. Getting down to the Hankou Beach Park gave me life, local Wuhan folk were out in their droves as the temperate climbs of early summer blessed that Sunday afternoon! I had wanted to revisit the Beach Park for a time to fully embrace the other historical Hankou sights. Hankou's Bund turned up the heat and waved away any summer dismay! Shopping doesn't impress me much in China so I gave Jianghan Road a fleeting wave of my attention, I was on the hunt for some vintage Hankou! Historically located with the British Concession I was gagging to see Poyang Road, ditching Google Maps because it always had me going around in circles I challenged my Chinese skills to check the directions on Baidu Maps to reach that rustic Hankou sight. The contrast between the brash shopfronts of Jianghan Road to the understated chill of Poyang Road felt just right. Branching back onto Qingdao Road I saw a building that looked like a former European bank being renovated, hopefully a new historic place to explore in Hankou? Little did I know that Wuhan would having some of the worst rain in years after a succession of those sunshine days, how I didn't appreciate that shade! Making the most of the bright and breezy conditions I could kissed goodbye to sightseeing until August! My grand Shanghai Surprise from 2015 felt like a world away Wu! July 2016 had me working hard, as the sun beaten down on my Guanggu Kindergarten it was back to business after our Dragon Boat Festival holiday that I took to Nanjing, Jiangsu. I have mentioned about my Nanjing trip a few times before I got this post together, OK? My students were getting restless with the humid weather and they quite frankly wanted their summer break! Little did I know that I had been selected as Etonkids English Specialist of Month for July 2016! I had no idea I had been selected for that amazing award, it was truly a shock to me because all I do is work my hardest every week for the children and as part of the team at my school. Over that academic year I learned the hard way that teaching English in China isn't no walk in the park, it's a valuable lesson and it will hopefully give me the tools and experience to further a career teaching. I was flying high during that crazy moment! Snatching trophies! The summer semester had me on a mission to get everything finished within the time constraints, it wasn't a period of sadness because I had a goal to work towards! What seemed like the great flooding hit Wuhan during the first week of July 2016, closing my school for two days it caused a lot disorder in a already frantic city, let's just say the city planners forgot to think about drainage before building the newer parts of the city first! My Dragon Boat Festival trip to Nanjing seemed like a world away, but I knew that July was purely about getting down to work. Having the purpose and the chance to start my savings right for I had been enjoying my money too much and had not cared to invest money into my next adventure. I was overjoyed to be completing my first academic year at Etonkids, Wuhan as an English Specialist. Saying goodbye to my friend Fiona after that flood day wasn't exactly what I wanted but we had our reunion to be ready for! Of course keeping busy was better then! August unlocked the key to some well earned rest and relaxation, having my visa renewed during that month meant it was better to stay within Hubei province. Getting out of Wuhan's city core was just what I wanted, heading to Huangpi District I went with a friend to Mulan Scenic Area to take in the sights of Mulan Mountain, Mulan Heaven Lake and to be surrounded by a village out-of-town setting. Looking down from the top was well worth the drive from Guanggu, Wuhan. The scenery was beautiful with a vista that trailed into the distance. Going back to ground level it was time to climb every mountain, the walk through to the Heaven Lake felt more like the descent into hell! I was not loving looking like a hot mess, I wanted out but knew that the view would be well worth the struggle, shamelessly the point was I hate exercise! Finally, the heaven like lake in my view it was well worth the climb Wu! Never again! Before the autumn came to town I got my final sightseeing day on the go with a planned visit to East Lake and the Hubei Provincial Museum but that wasn't meant to be. I had forgotten within the delirium of the scorching summer weather that the museum closes on Mondays, being the day I had chosen I decided to give the Tingtao Scenic Area a final visit as I had been introduced to this part of East Lake in September 2015. Having a peaceful stroll beside the waters of East Lake was lovely till the heavens opened! I was determined and then some to get out into Wuhan for the day! Take two, I got the museum and saw what I needed to but I really wanted to see the former residence of Mao Zedong! It took some going but with the kindness of a police officer I was driven around a secret estate that was no longer tourist appropriate, I was thankful for that kind guy taking the time out to help me! My summer wasn't about far flung or out-of-province visits, I got around! Thank you Wuhan!